Halloween – I love it. 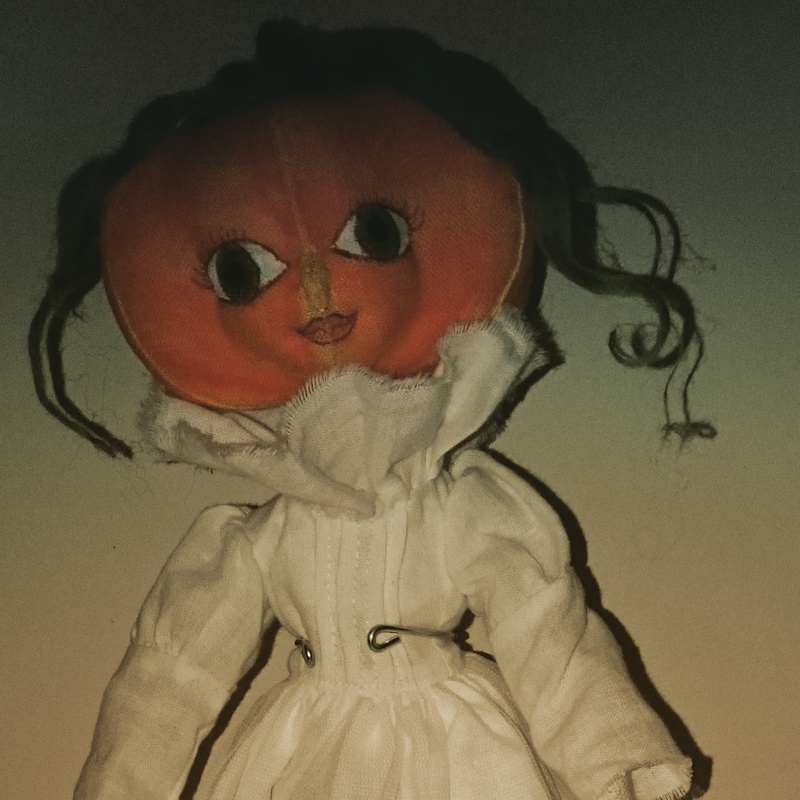 I’m all about Halloween at the moment and I wanted to make a pumpkin headed doll just to try it out, and I’m so pleased with the way her head has turned out that I wanted to share it with you. I know how to make a ball with several pieces of an oval shape with pointed ends,sewn together. But what I wanted was a pumpkin, so round but not ball, It would need a flatter shape with a cylinder in the middle to give it height, so sides on it would look like a rectangle. So I adapted the shape to give it more of a middle and decided that the best way to make it flat was to anchor the top and bottom together after she was done. (Note this pumpkin has become a girl already, well as soon as she had eyes, she told me her name would be Willamina Pumpkin Pie, so that was decided). 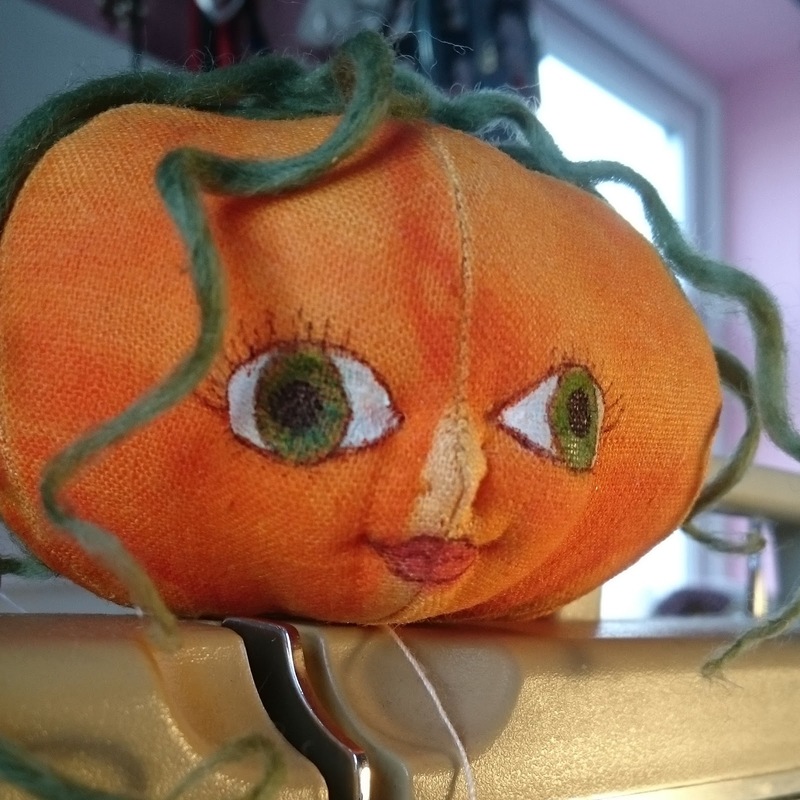 Something strange happened during stuffing though, a pumpkin grew while I packed more fluff inside her, she became the right shape all by herself no need for me to add any additional flattening. Now how did that happen? I really don’t know but I’m very glad it did as she is perfect don’t you think. So next was the thought of how to finish her and I decided to make tendrils out of some merino wool roving. I took strands felted them up and then dried them around wooden dowels, and they turned out perfect too. And I was so pleased I made some smaller versions, and then a bigger one too. but after all this Halloween horror my thoughts turned towards Christmas and a snowman, take out two panels and hey presto I already have the pattern for a snow man. 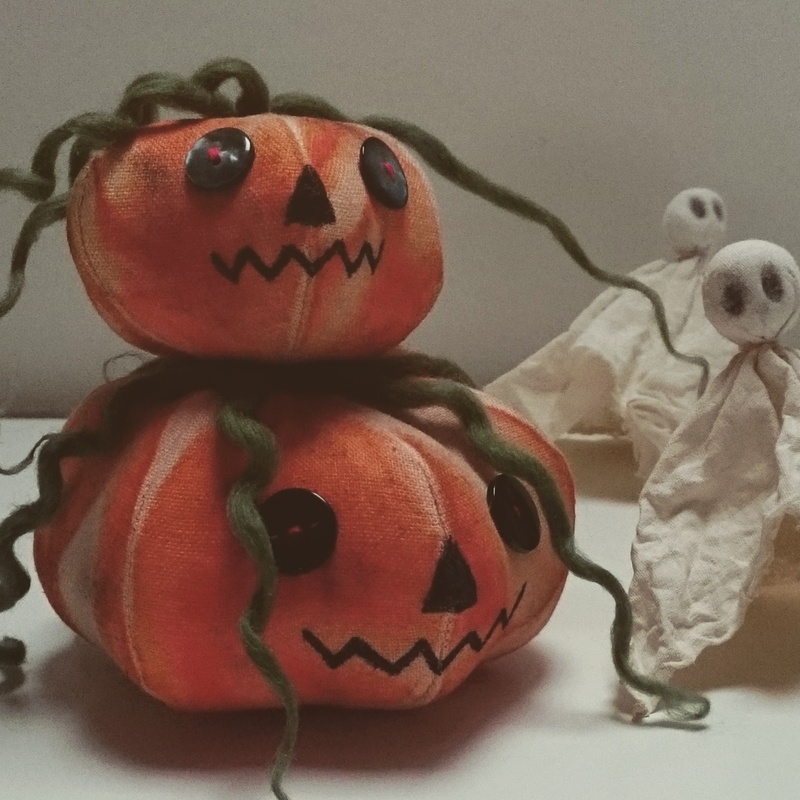 Your pumpkins for Halloween are the most cute pumpkins I have ever seen:) I also love Halloween. I think it is really interesting celebration and really different from other holidays. I will share your post with my writer from http://best-essays.co.uk/ he will love it.